Those waking up this morning to discover the death of Martin McGuinness will likely take one of two mind-sets: a former terrorist commander personally culpable for the deaths of over a thousand people, or a reformed politician who ditched his gun for a pen and delivered peace to Northern Ireland. The peace process has been in place in Northern Ireland for almost twenty years now, a tense, precarious sharing of power between two intensely polar opposite ideologies: Irish Republicanism and Unionism. Both dangerous in its rhetoric, both responsible for the abhorrent period known as The Troubles. It’s easy to look back on the years between 1968 and 1997 and place the blame on transforming the province of Ulster into a warzone squarely on the Provisional IRA and republican terrorists. That is only a half-truth and fails to look at the wider picture. It also explains why a peace process took so long to come to fruition. Equally as culpable are a series of British Governments and their heavy-handed, short-sighted approach to dealing with the issue dubbed the ‘Irish Question; their guise as the British Army on the streets of Ulster resulted in atrocities that only caused to stir Irish Nationalism and ignite the torch paper. Unionist terrorist groups, so often over-looked, were just as brutal, murderous and extremist in their thinking as their republican counterparts. Amidst all this was a man who even by his own admission was an active member in the Provisional IRA, but was early to recognise the power of diplomacy in his quest for Irish reunification. As far back as 1972, in the wake of Bloody Sunday, the darkest of days for Northern Ireland and Westminster’s involvement in the province, McGuinness was part of a six-man delegation alongside Gerry Adams to travel to London for talks with British officials to find a solution to the brewing hostilities. Chosen to inject a youthful vigour to Sinn Fein’s façade, the pair left a lasting impression in London, and McGuinness was noted as a potential instigator of peace even then. During the eighties, it was McGuinness alongside senior figures who spearheaded and encouraged the ‘dirty protest’ by imprisoned Irish republicans. The protests, aimed at restoring political status for paramilitary prisoners, climaxed with the death of hunger striker Bobby Sands at the Maze Prison in Belfast. The dirty protests from ill-treated prisoners at the Maze helped to personalise their plight, put an international spotlight on the nationalist cause and provided McGuinness and co. an electoral platform from which to launch a peace process. 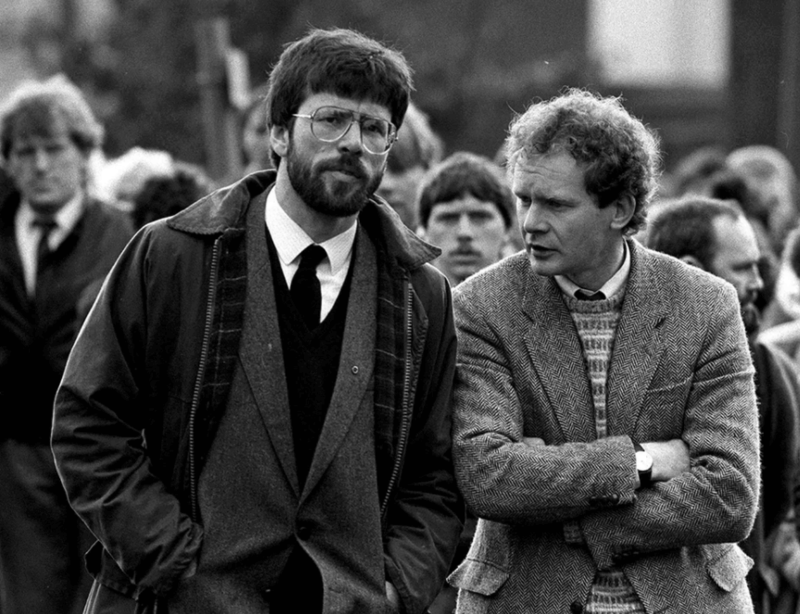 The double-act of Adams and McGuinness endured the rocky road from frontline fighting to frontline politics, and whilst the former has audaciously rebuked claims of his involvement as a Belfast IRA commander during the seventies, the latter knew that any legitimacy and acceptance of his political career rested on the recognition of his past role as a terrorist. He refused to let his tainted past disrupt what he genuinely came to view as the only long-term option for peace in Northern Ireland. From meeting with Prime Ministers and Presidents to reconciling with family members of those killed by his paramilitary hand, McGuinness has pushed harder than anyone to ensure that the peace process lasts until this day. 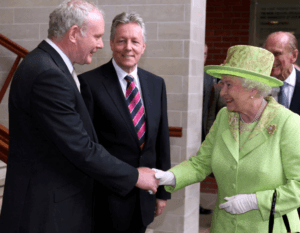 The image of the former IRA strongman shaking hands with the Queen, who famously quipped “I’m still alive” when he asked how she was, represents how far we have come from the dark days of the Troubles. Indeed, his final act as a politician, his resignation to force the hand of Arlene Foster, shamed in the recent ‘cash for ash’ scandal, was one last attempt to guarantee the power-sharing agreement in Stormont. Like him or loathe him, there is no denying the leading role McGuinness has played in bringing peace to Northern Ireland.